Author: Chris Collins, Levi Namaseb. Series edited by: Rainer Voßen. N|uuki is a nearly extinct Southern Khoisan language spoken by a few elderly people (Crawhall 2005 states 12 speakers) in and around the town of Upington / South Africa in the Northern Cape. The word N|uu is a verb meaning to speak the language described in this grammar; now­adays, both N|uu and N|uuki are used to refer to the language. This grammar is largely based on the western N|uuki dialect. The primary field work for this grammatical sketch was carried out in the years of 2004, 2005, and 2007. In addition, Levi Namaseb has made yearly field trips for the purpose of recording oral texts and teaching the language to the youth since 1998. The authors intend to continue work­ing on N|uuki and produce a much larger reference grammar in the future. N|uuki is a tonal language, each word must be pronounced with a particular tone (e.g. high, low, rising). Tone levels are not indicated in this grammar, because the tonal system has not been worked out yet. Further, there has been no phonological study of vowel length in N|uuki, and so indications of vowel length must be taken as very preliminary. 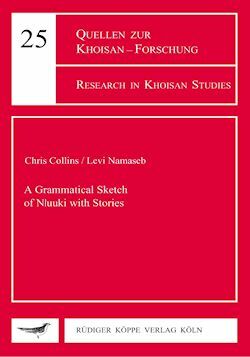 The grammar of N|uuki shares a number of properties with the other Khoisan languages. For example, all non-central Khoisan languages make use of the linker described in chapter 12, and serial verbs described in chapter 15. In order to illustrate various aspects of N|uuki grammar, the authors include four transcribed stories in the Appendix. One of those stories is presented in Appendix 2 in a preliminary orthog­raphy.